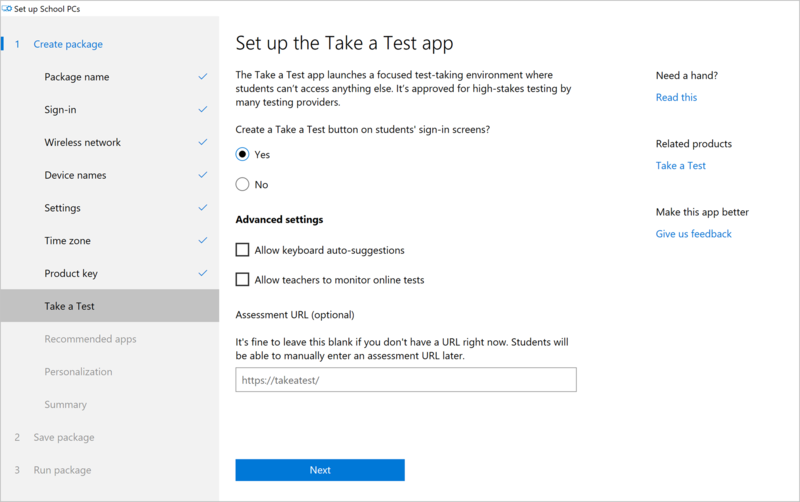 IT administrators and technical teachers can use the Set up School PCs app to quickly set up Windows 10 PCs for students. The app configures PCs with the apps and features students need, and it removes the ones they don't need. During setup, if licensed in your tenant, the app enrolls each student PC into a mobile device management (MDM) provider, such as Intune for Education. You can then manage all the settings the app configures through the MDM. Joins each student PC to your organization's Office 365 and Azure Active Directory tenant. Enables the optional Autopilot Reset feature, to return devices to a fully configured or known IT-approved state. Utilizes Windows Update and maintenance hours to keeps student PCs up-to-date, without interfering with class time. Locks down the student PC to prevent activity that isn't beneficial to their education. This article describes how to fill out your school's information in the Set up School PCs app. To learn more about the app's functionality, start with the Technical reference for the Set up School PCs app. Before you begin, make sure that you, your computer, and your school's network are configured with the following requirements. Be within range of the Wi-Fi network that you configured in the app. Have a wired Ethernet connection when you set them up. USB drives are, by default, FAT32-formatted, and are unable to save more than 4 GB of data. If you plan to install several apps, or large apps like Microsoft Office, you'll need more space. To create more space on the USB drive, reformat it to NTFS. Go to the Start > This PC. 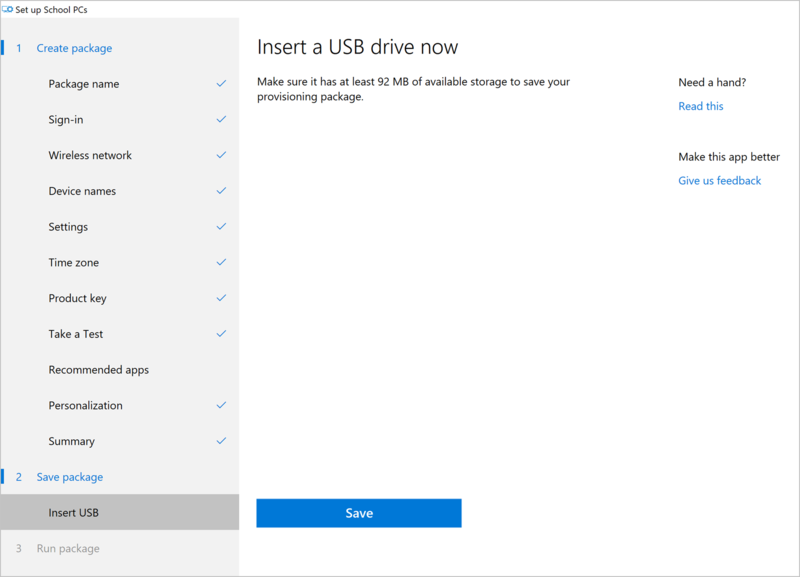 In the Devices and drives section, find your USB drive. Right-click to see its options. Select Format from the list to bring up the Format drive name window. Set File system to NTFS. Click Start to format the drive. Apply new packages to factory reset or new PCs. If you apply it to a PC that's already set up, you may lose the accounts and data. If a PC has already been set up, and you want to apply a new package, reset the PC to a clean state. To begin, go to the Settings app on the appropriate PC. Click Update & Security > Recovery. In the Reset this PC section, click Get started. Click Troubleshoot and then choose Reset this PC. If the option appears, select Only the drive where Windows is installed. Click Just remove my files. This section offers recommendations to prepare you for the best possible setup experience. 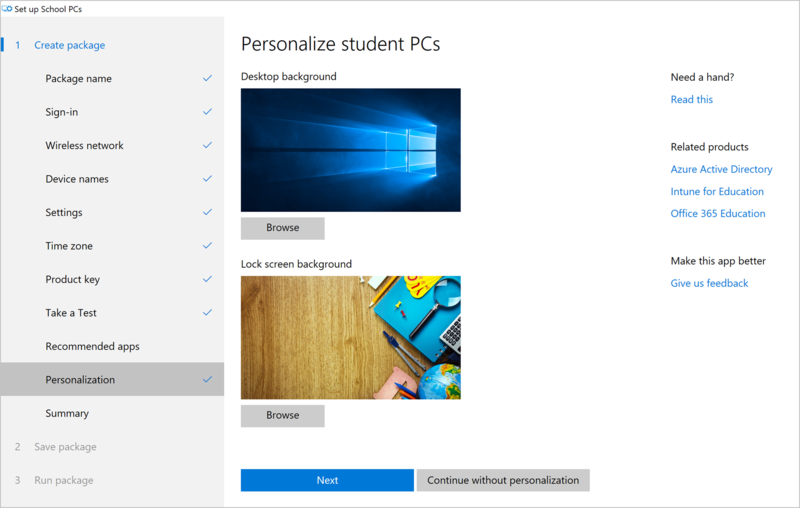 We recommend you run the IT administrator or technical teacher's device on the same Windows 10 build as the student PCs. Check the OS requirements in the Set up School PCs app. We recommend using the latest Set up School PCs app along with the latest Windows 10 images on the student PCs. 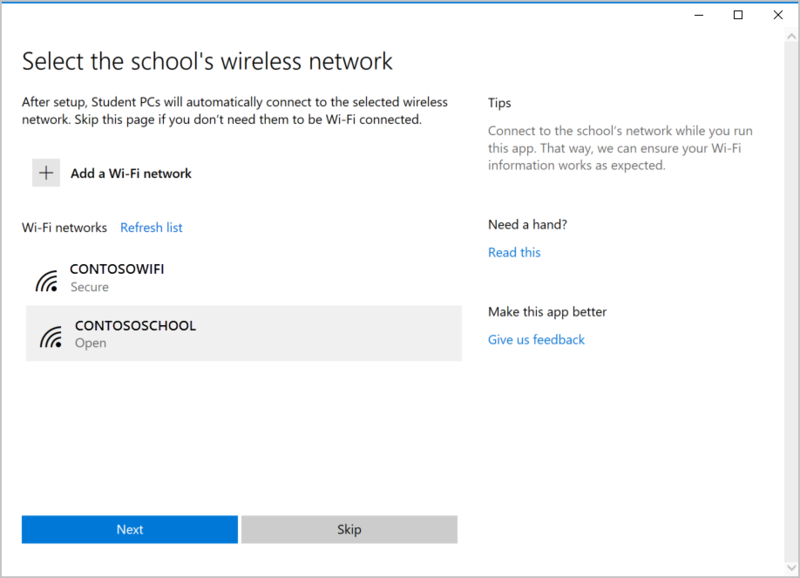 To check the app's OS requirements, go to the Microsoft Store and locate the Set up School PCs app. In the app's description, go to System Requirements > OS. We recommend that you run the Set up School PCs app on a computer that's connected to your school's network. That way the app can gather accurate information about your school's wireless networks and cloud subscriptions. If it's not connected, you'll need to enter the information manually. Don't use Set up School PCs over a certification-based network, or one where you have to enter credentials in a browser. If you need to set up many devices over Wi-Fi, make sure that your network configuration can support it. Configure your DHCP so at least 200 IP addresses are available for your devices. Having available IP addresses will allow you to set up many devices simultaneously. Configure your IP addresses to expire after a short time--about 30 minutes. IP addresses will free up quickly so you can continue to set up devices without network issues. 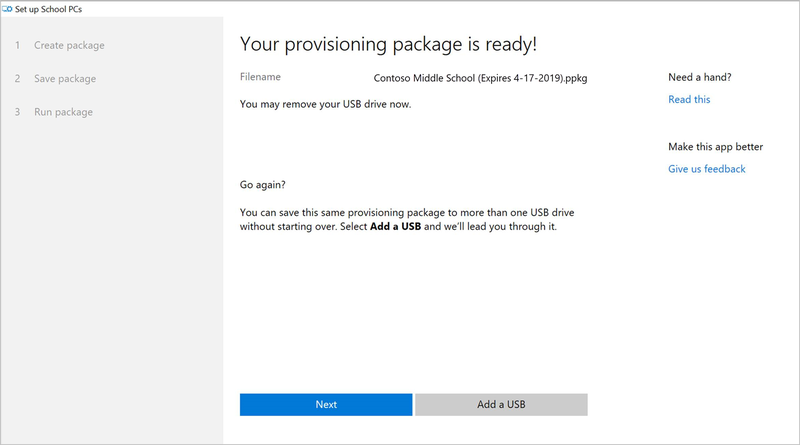 Only use the provisioning package on PCs that you want to configure and lock down for students. After you apply the provisioning package to a student PC, the PC must be reset to remove the settings. To set up more than one PC at the same time, save the provisioning package to additional USB drives. Then plug the USBs in at the same time during setup. We strongly recommend that you avoid changing preset policies. Changes can slow down setup, performance, and the time it takes to sign in. 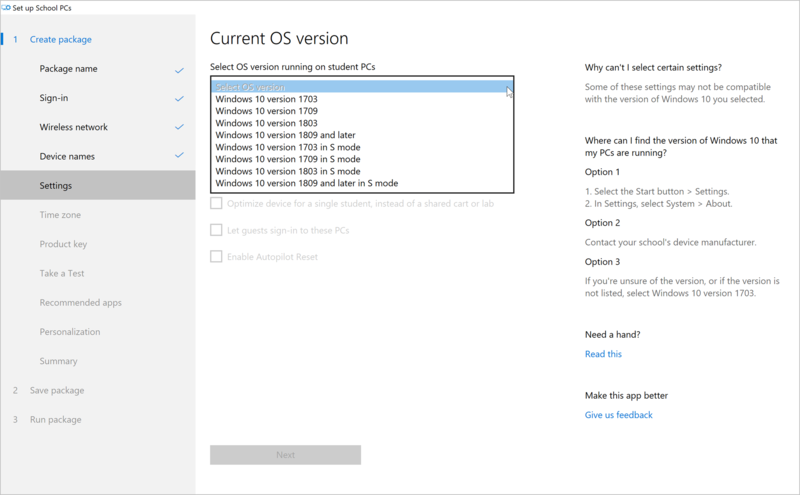 The Set up School PCs app guides you through the configuration choices for the student PCs. To begin, open the app on your PC and click Get started. A package expiration date is also attached to the end of each package. 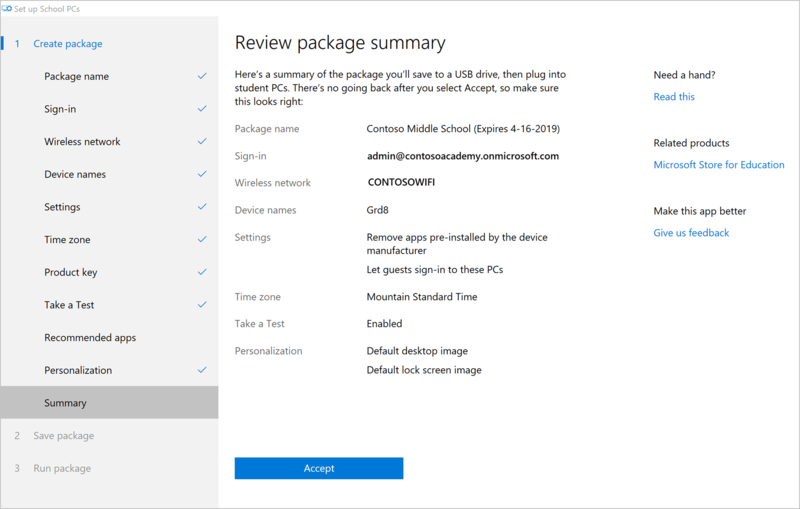 For example, Set_Up_School_PCs (Expires 4-16-2019). The expiration date is 180 days after you create your package. After you click Next, you can no longer change the name in the app. 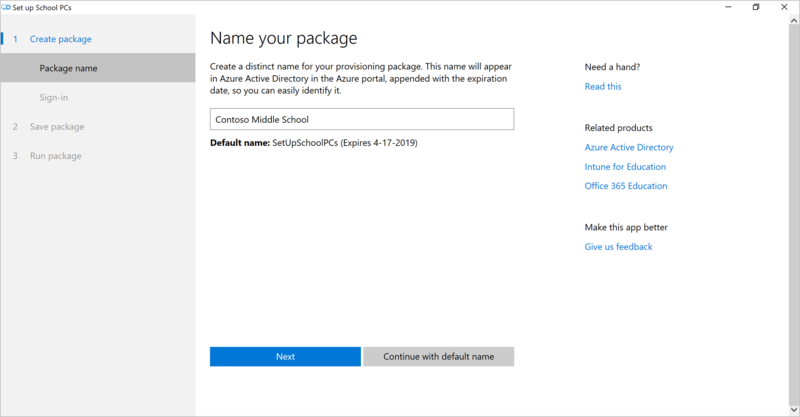 To create a package with a different name, reopen the Set up School PCs app. To change an existing package's name, right-click the package folder on your device and select Rename. This action does not change the name in Azure AD. If you have Global Admin permissions, you can go to Azure AD in the Azure portal, and rename the package there. Select how you want to sign in. a. 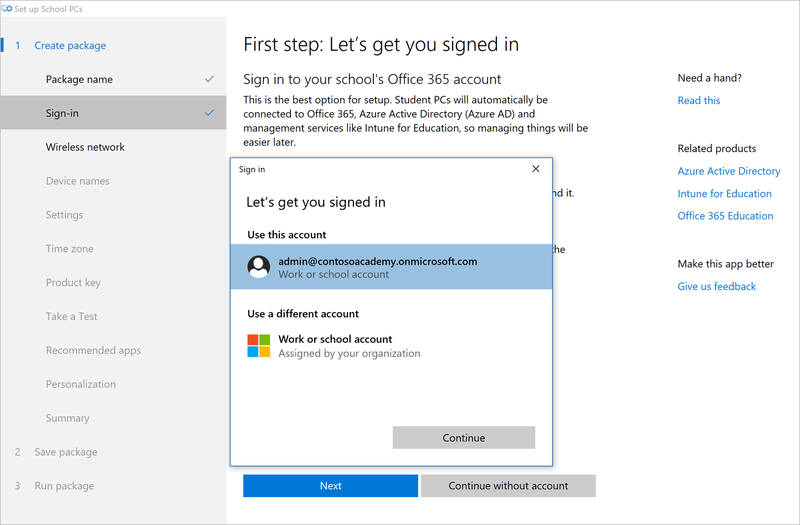 (Recommended) To enable student PCs to automatically be connect to Office 365, Azure AD, and management services like Intune for Education, click Sign-in. Then go to step 3.
b. To complete setup without signing in, click Continue without account. Student PCs won't be connected to your school's cloud services and managing them will be more difficult later. Continue to Wireless network. In the new window, select the account you want to use throughout setup. a. Click Work or school account > Continue. b. Type in the account username and click Next. c. Verify the user account and password, if prompted. 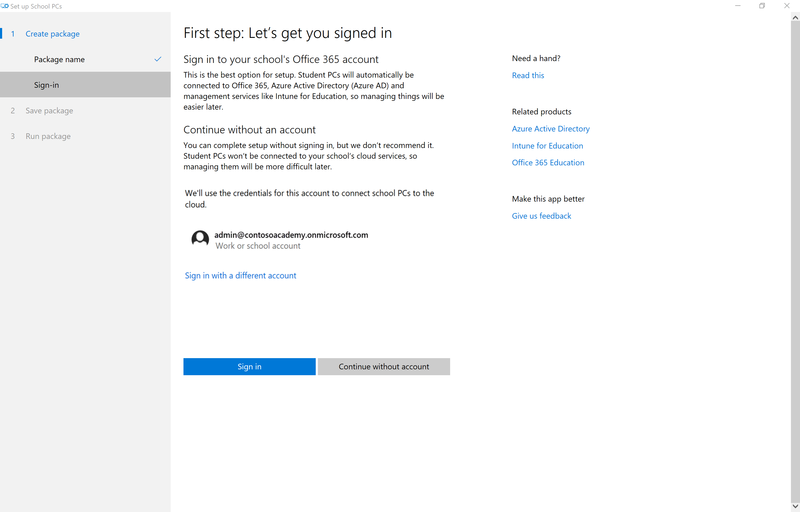 Click Accept to allow Set up School PCs to access your account throughout setup. When your account name appears on the page, as shown in the image below, click Next. Add and save the wireless network profile that you want student PCs to connect to. Only skip Wi-Fi setup if you have an Ethernet connection. Select your school's Wi-Fi network from the list of available wireless networks, or click Add a wireless network to manually configure it. Then click Next. Create a short name to add as a prefix to each PC. 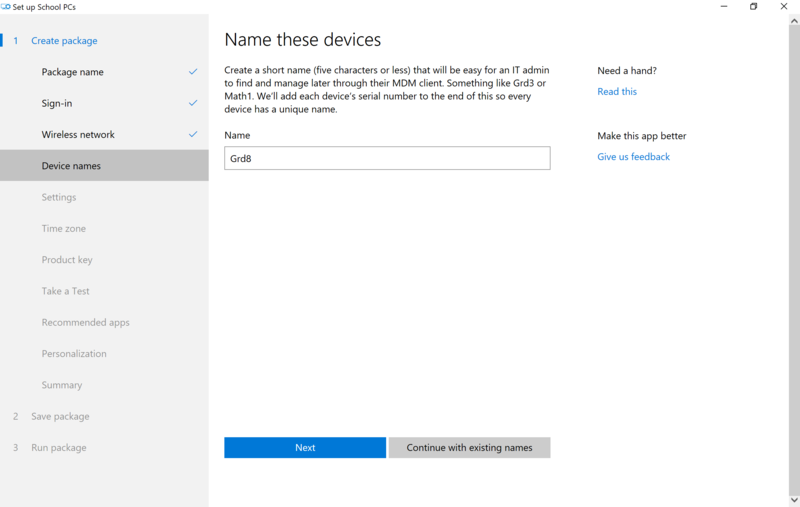 This name will help you recognize and manage this specific group of devices in your mobile device manager. The name must be five (5) characters or less. To make sure all device names are unique, Set up School PCs automatically appends _%SERIAL% to the name. For example, if you add Math4 as the prefix, the device names will appear as Math4 followed by a random string of letters and numbers. To keep the default name for your devices, click Continue with existing names. Select additional settings to include in the provisioning package. To begin, select the operating system on your student PCs. Setting selections vary based on the OS version you select. The example screenshot below shows the settings that become available when you select Windows 10 version 1703. The option to Enable Autopilot Reset is not available for this version of Windows 10. The Time zone setting, shown in the sidebar of the screenshot above, is not made available to versions of Windows 10 in S mode. If you select a version in S mode, Time zone will become disabled. The following table describes each setting and lists the applicable Windows 10 versions. To find out if a setting is available in your version of Windows 10, look for an X in the setting row and in the version column. What happens if I select it? Remove apps pre-installed by the device manufacturer X X X X Uninstalls apps that came loaded on the computer by the device's manufacturer. Adds about 30 minutes to the provisioning process. Allow local storage (not recommended for shared devices) X X X X Lets students save files to the Desktop and Documents folder on the Student PC. Not recommended if the device will be part of a shared cart or lab. Optimize device for a single student, instead of a shared cart or lab X X X X Optimizes the device for use by a single student, rather than many students. Recommended option only if the device is not shared with other students in the school. Single-optimized accounts are set to expire, and require a signin, 180 days after setup. This setting increases the maximum PC storage to 100% of the available disk space. In this case, student accounts aren't deleted unless the account has been inactive for 180 days. Let guests sign in to these PCs X X X X Allows guests to use student PCs without a school account. Common to use within a public, shared space, such as a library. Also used when a student loses their password. Adds a Guest account to the PC sign-in screen that anyone can sign in to. 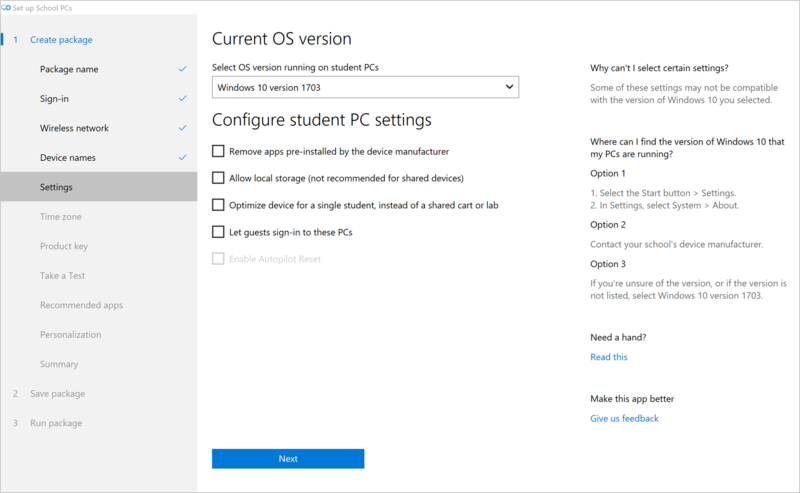 Enable Autopilot Reset Not available X X X Lets you remotely reset a student’s PC from the lock screen, apply the device’s original settings, and enroll it in device management (Azure AD and MDM). Requires Windows 10, version 1709 and WinRE must be enabled on the PC. Setup will fail if both requirements aren't met. Lock screen background X X X X Change the default screen lock background to a custom image. Click Browse to search for an image file on your computer. Accepted image formats are jpg, jpeg, and png. After you've made your selections, click Next. If you are using the Autounattend.xml file to reimage your school PCs, do not specify a time zone in the file. If you set the time zone in the file and in this app, you will encounter an error. 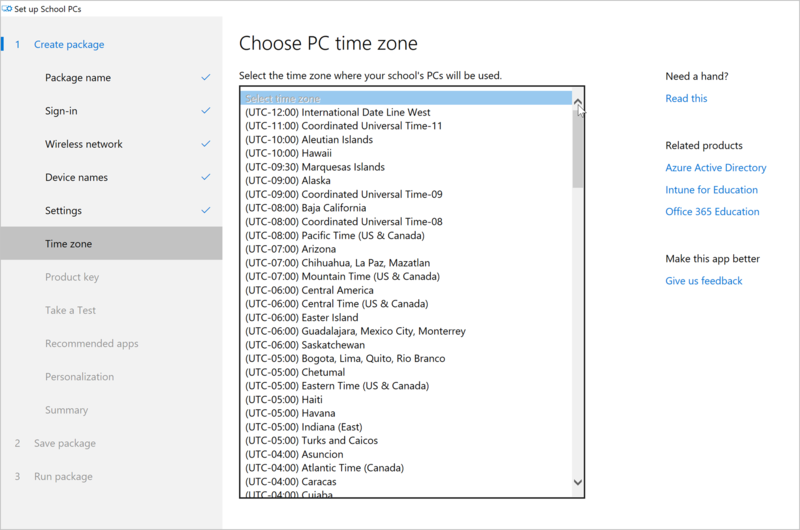 Choose the time zone where your school's PCs are used. This setting ensures that all PCs are provisioned in the same time zone. When you're done, click Next. Upgrade your current edition of Windows. For example, if you want to upgrade from Windows 10 Education to Windows 10 Education Pro, enter the product key for the Pro edition. Change the product key. 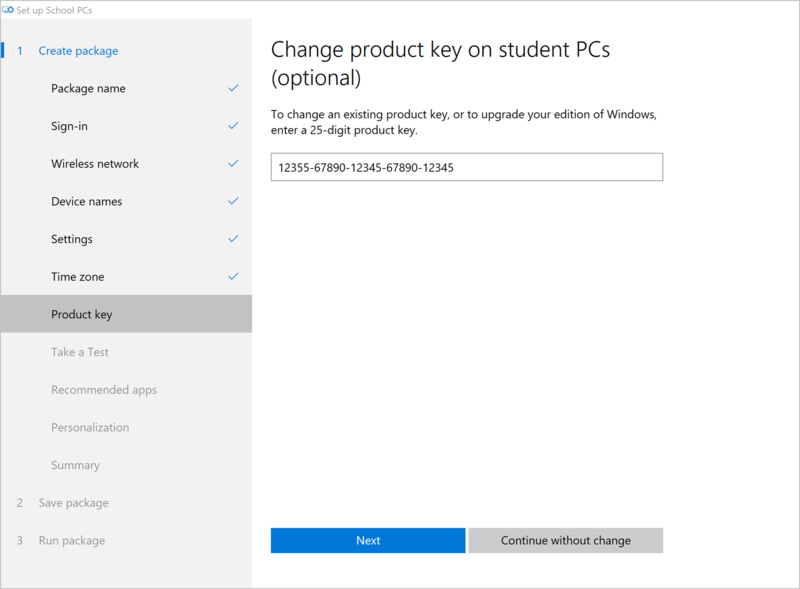 If you want to associate student devices with a new or different Windows 10 product key, enter it now. Set up the Take a Test app to give online quizzes and high-stakes assessments. During assessments, Windows locks down the student PC so that students can't access anything else on the device. Select Yes to create a Take a Test button on the sign-in screens of your students' PCs. Allow keyboard auto-suggestions: Allows app to suggest words as the student types on the PC's keyboard. Allow teachers to monitor online tests: Enables screen capture in the Take a Test app. Enter the URL where the test is hosted. When students log in to the Take a Test account, they'll be able to click or enter the link to view the assessment. 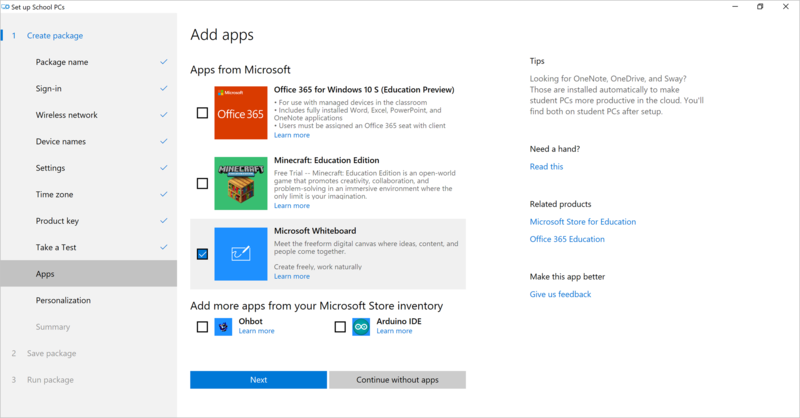 Choose from Microsoft recommended apps and your school's own Microsoft Store inventory. The apps you select here are added to the provisioning package and installed on student PCs. After they're assigned, apps are pinned to the device's Start menu. If there aren't any apps in your Microsoft Store inventory, or you don't have the permissions to add apps, you'll need to contact your school admin for help. If you receive a message that you can't add the selected apps, click Continue without apps. Contact your school admin to get these apps later. The following table lists the recommended apps you'll see. Office 365 for Windows 10 in S mode (Education Preview) Setup is only successful on student PCs that run Windows 10 in S mode. The PC you running the Set up School PCs app is not required to have Windows 10 in S mode. Upload custom images to replace the student devices' default desktop and lock screen backgrounds. Click Browse to search for an image file on your computer. Accepted image formats are jpg, jpeg, and png. If you don't want to upload custom images or use the images that appear in the app, click Continue without personalization. This option does not apply any customizations, and instead uses the devices' default or preset images. Review all of the settings for accuracy and completeness. Check carefully. To make changes to a saved package, you have to start over. To make changes now, click any page along the left side of the window. Insert a USB drive. The Save button will light up when your computer detects the USB. Choose your USB drive from the list and click Save. When the package is ready, you'll see the filename and package expiration date. You can also click Add a USB to save the same provisioning package to another USB drive. When you're done, remove the USB drive and click Next. 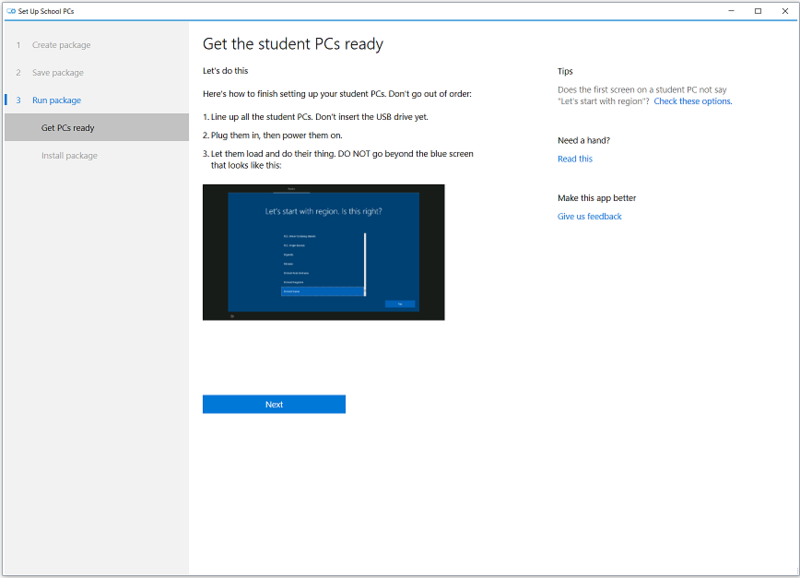 Complete each step on the Get PCs ready page to prepare student PCs for set-up. Then click Next. The provisioning package on your USB drive is named SetupSchoolPCs_<devicename>(Expires <expiration date>.ppkg. 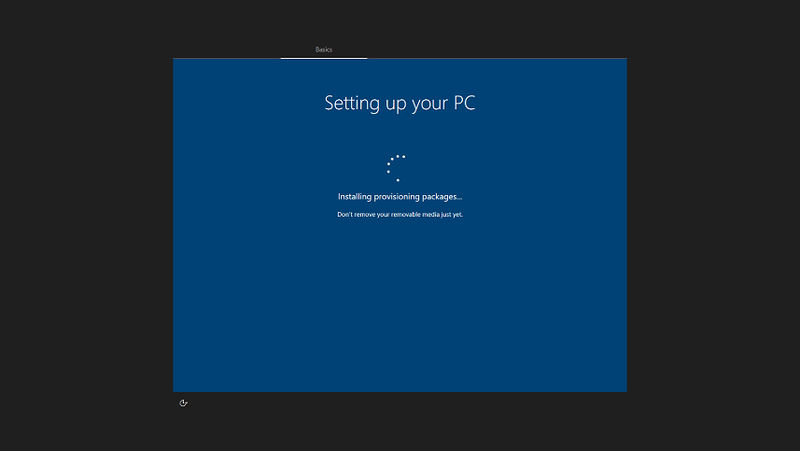 A provisioning package applies settings to Windows 10 without reimaging the device. When used in context of the Set up School PCs app, the word package refers to your provisioning package. 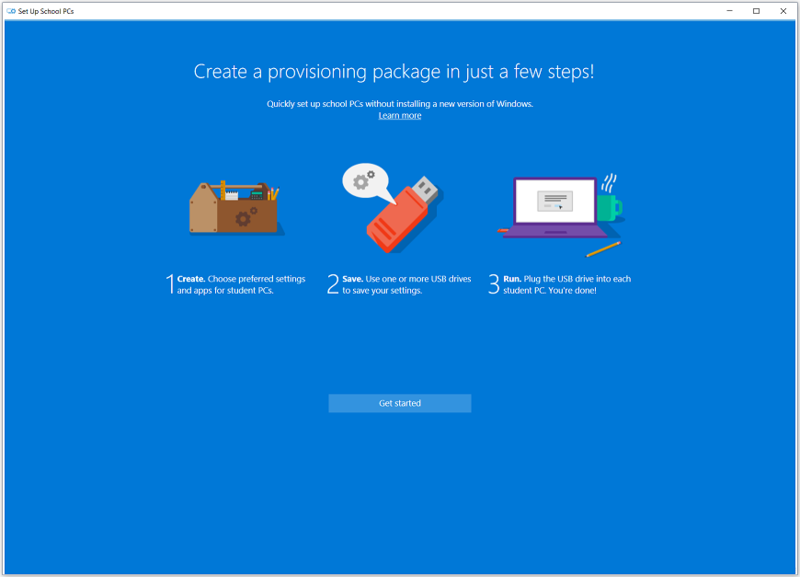 The word provisioning refers to the act of installing the package on the student PC. This section describes how to apply the settings to a PC in your school. The PC must have a new or reset Windows 10 image and must not already have been through first-run setup (also referred to as OOBE). For instructions about how to reset a computer's image, see Prepare existing PC account for new setup. Start with the student PC turned off or with the PC on the first-run setup screen. 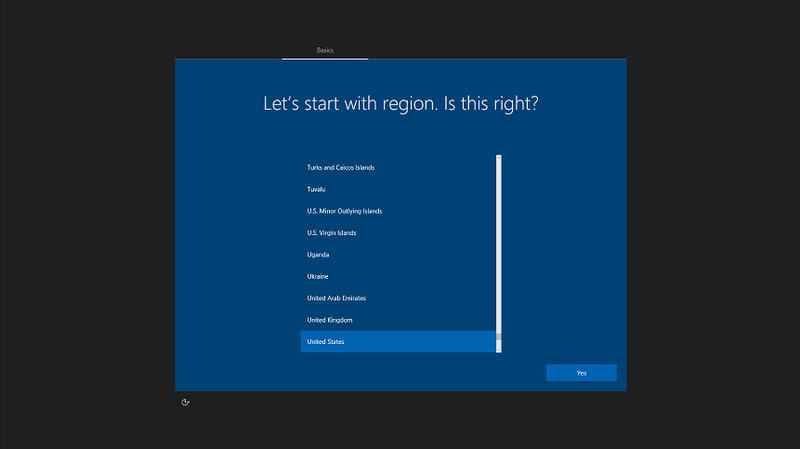 In Windows 10 version 1803, the first-run setup screen reads, Let's start with region. Is this right? If the PC has gone past the account setup screen, reset the PC to start over. To reset the PC, go to Settings > Update & security > Recovery > Reset this PC. Insert the USB drive. Windows automatically recognizes and installs the package. When you receive the message that it's okay to remove the USB drive, remove it from the PC. If there are more PCs to set up, insert the USB drive into the next PC. If you didn't set up the package with Azure AD Join, continue the Windows device setup experience. If you did configure the package with Azure AD Join, the computer is ready for use and no further configurations are required. If successful, you'll see a setup complete message. The PCs start up on the lock screen, with your school's custom background. Upon first use, students and teachers can connect to your school's network and resources.